Seriously, have you ever been out surfing and had an elephant glide past you on a wave? I’ll bet all six of my toe rings that you haven’t. 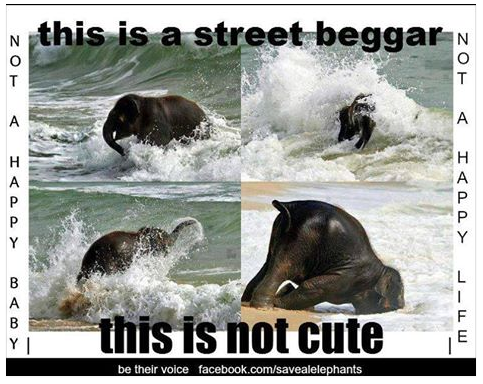 That’s because elephants don’t surf. There’s a series of photos and videos that have been making their way around the net for far too long. They feature a baby elephant ‘playing’ in the surf. It looks all very cute, but it is a very wrong picture. So very wrong! 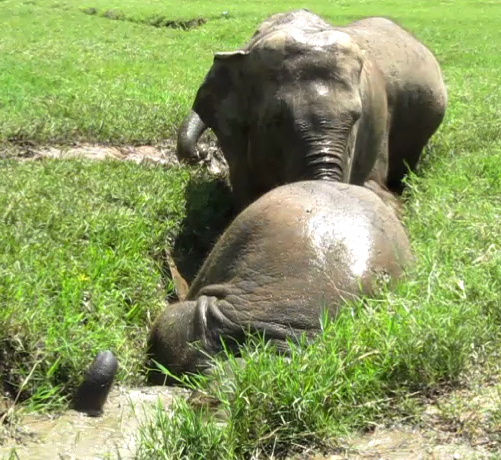 The Mahout Foundation have put out a video that shows what goes into the training of baby elephants – the ones you see in these ‘Have you ever seen anything so cute?’ pics, the one’s that are still unfortunately left in circuses, the ones you buy bananas for on the streets in Bangkok and the ones apparently frolicking in the surf, amongst others. and pass it on to as many people as you can. Our tourist dollars speak very loudly – lets spend them as wisely as we can and really help these elephants to have a much better life than the hell they’re living through at the moment. This baby should be under shade, with its mother, playing in fresh water. Please help spread this info around so people know the real situation. Thank you. This entry was posted in Elephants, Nature, Random Factoids & Stuff, Ravings - random wafflings, Ravings on Thailand, Travel and tagged Asia, Asian holiday, Baby elephant, circuses, elephant, Elephant Nature Park, elephant on beach, elephant rides, elephant surf, Ethical tourism, Mahout, nature, Photography, Torture, Tourism, Volunteering, Voluntourism. Bookmark the permalink.